Rick and one other hiker joined the group to repeat the annual local chapter climb of this magnificent peak. We altered the usual schedule by driving up Saturday morning, then doing the backpack to base camp at Lake Helen in the afternoon. It is almost 2,600 feet gain to this camp from the ski area, but we knew we could do it easily. Rick was mainly in charge, effectively, since he was driving, and needed to do this peak for his first time. One person had started with us, but had problems and had to abort. Another climber, seeing us starting up, asked to join us. For me, as long as basic qualifications are met, the more the merrier. 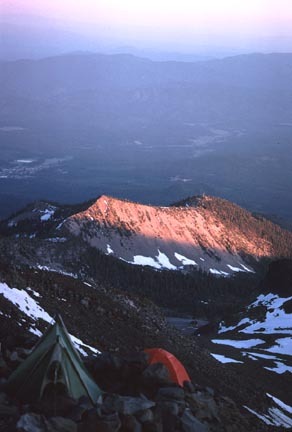 I had always climbed Shasta in one day. My first, unsuccessful, attempt involved a camp at Helen Lake. While there are rock ring shelters, the wind can be ferocious. I couldn't believe the poor weather then. I had a miserable night's sleep, then retreated down the mountain. Amazingly to me, other climbers had made the summit, starting in the middle of the night! We reached base camp at Lake Helen in time to enjoy a very pleasant afternoon, then a glorious sunset. Rick used some supermarket camping department stuff. He is not as committed to the outdoors as many of the prolific peak climbers. Why pay $400 for a tent when at K-Mart you can get one for $25? The sunshine hit an outcrop as the evening sky glowed faint red. The lights of Mt. Shasta City blinked on as we watched. It looked like it might be a highly pleasant evening. Back in town, we had heard from some kids of the nighttime high winds. I took this warning seriously, since I had experienced this on my first try. I tried to dig an alternate snow cave once to base camp. I dug a foot or two, then came to solid ice. My shovel or ice axe didn't hardly make a dent in this! I managed to build a trench, with an insert for my feet into the shallow cave. I began to think that I wouldn't need this survival work, but it was good practice. Snow caves are fine, but don't think you can always dig one! I retired into Rick's two man tent. The evening air had been so still and peaceful. Then, at about midnight, the winds suddenly came up. It was like holding on to an airplane wing. The tent was flapping in a roar. I picked up my bag and foam pad to retreat to my ice trench. The wind grabbed my foam pad and it flew away at 40 mph. I went back for alternate insulation with my other gear. It wasn't much better for sleeping anyway. Rick stayed in the tent, which came down. I didn't hardly sleep at all. I looked about as the dawn light came up. There were about five other expensive dome tents sharing the base camp area. All of them had come down. Rick was correct with his cheap purchase this time. No tent would survive standing those winds. I was feeling sick, but we had to try for the top. We put on crampons and began the long climb up to the Heart. I didn't bring my day climbing pack, instead using my soft backpack for my things. This didn't work well, and I never tried that again. There had been a wet snow slide in the Gulch. Clumps of snow had coalesqued at the base of the steep part from the Heart. The conditions were too cold and icy to make such an avalanche hazard for us today. Climbers have been buried by slides in the winter here. The story goes, upon one person disappearing on a winter attempt, the search and rescue was eventually called off. In the spring, a climber noticed a boot sticking out of the snow. That was him. Rick was determined to make the top. He continued ahead, with me following. The other climber was far ahead of both of us. The wind was still strong. As I reached the Thumb, other climbers were turning back. Rick had continued, and I was unable to communicate with him. Each step was a chore. I struggled up, but just about the top of Misery Hill, at maybe 13,600 feet elevation, I decided that I had to get down and prepare for a long week at work. I needed sleep! Somehow, I managed to get a picture of the Central Valley to the south. Rick and the other fellow reported making the summit. They waited, but saw I wasn't coming up. Rick came up behind me as I was glissading down from the Red Banks. He was coming down with his crampons on. Fortunately for me, he was able to stop just behind me. I was going slow, giving the two a chance to catch up with me. The snow was icy, this early in the day, and I ripped my nylon pants. Glad that they were successful, I admired their fortitude. But this would be the last time camping at Lake Helen for me. Back to the car, driving home was Hell. It wasn't that late in the day, but sleep-deprivation is torture. I did whatever I could to get ready for Monday morning on my job. I must have drunk a gallon of coffee coming to work. It's just not worth screwing up your system for any of these climbs. Usually, returning from a High Sierra peak, you've had a good sleep Saturday night, and fall asleep quickly early Monday morning. I never had hardly felt so bad than from this failed attempt. Other climbers admit the suffering from the long drives home. I almost always have a great time, pleased with another climbing success. Almost always alert and jumping on the return to work, this was helped with lots of coffee. It catches up with me mid-week, but I just would take a long night's sleep Tuesday or Wednesday. People would then call for the next weekend, to see that I was already sleeping at 6 p.m. Well, to be going into middle age!